The date was March 22, 2008. On that day we were on our third day of vacation in New Jersey. After eating breakfast at the hotel we went sightseeing. We saw two mansions, a lighthouse and visited animals in a zoo. The two mansions that we saw were Southern Mansion and the Emlen Physick Estate, both located on Washington Street. Next we drove to North Wildwood, which is approximately 10 miles north of Cape May. North Wildwood is home to the Hereford Inlet Lighthouse. This is a view of lighthouse from the gardens. From North Wildwood we drove to the Cape May County Zoo. Admission to the zoo was free, with donations graciously received. We spent an enjoyable couple hours at the zoo. We saw owls, parrots, farm animals, monkeys, peacocks, birds, squirrels, waterfowl, giraffes, an ostrich, zebra, bison, elk, lion, fox, and reptiles. We particularly enjoyed watching the giraffes and the ostrich. The giraffes and ostrich were released from their house as we arrived at the “African Savanna”. One giraffe trotted to the feeding area. The ostrich seemed happy to be “free”, as we watched him run back and forth across the field. We ate dinner at The Pilot House. We returned home on March 24, after spending the night of March 23 at a family member’s house in Virginia. This concludes a look back at our New Jersey vacation in March 2008, when we spent one night in Atlantic City and two nights in Cape May. We keep talking about making a return trip to Cape May. I would like that. Perhaps one day we will make a return visit to Cape May. The date was March 21, 2008. On that day we were on our second day of vacation in New Jersey. I didn’t know it when we arrived the previous night, but we had a view of the Atlantic Ocean from our hotel room. We could see the ocean, as we looked past a large empty lot and several rundown buildings. It was a beautiful morning — blue sky and brilliant sunshine. The temperature, though, was a chilly 37 degrees. The temperature, however, was forecasted to rise into the low 50s, both in Atlantic City and in Cape May. We ate breakfast around 7:00 am. As is customary at Comfort Inn, we enjoyed a complimentary breakfast of waffles, hard-boiled eggs, coffee / tea, juice, fruit and pastries. The waffles were shaped to resemble symbols in a deck of cards. We checked out of our hotel around 9:00 am, left the car parked at the hotel and walked to the boardwalk. It was only a short walk to the casinos. We played the slots in two casinos: Bally’s Wild Wild West and Caesars. We played $50.00 ($25 each) and walked out of the casino with $97.45. The Boardwalk was only 100 yards from our hotel. We left Atlantic City around 11:00 am and arrived in Cape May about an hour later. We checked into our hotel, the Montreal Inn. Our hotel accommodations were lovely. We had a two-room suite — bedroom with two queen-size beds, a combination kitchen, dining room and living room. We had a full view of the ocean from the living room. Our hotel accommodation was a two-room suite. From the living room we had a good view of the Atlantic Ocean. We ate lunch at the Ugly Mug, located just steps from the Washington Street Mall. The Ugly Mug is one of Cape May’s oldest pubs. The atmosphere was cozy and intimate featuring a large square bar in the center of one large room. Surrounding the bar are booths and tables. The Ugly Mug is decorated with mugs, hundreds of mugs suspended from the ceiling. We ordered cheeseburgers for lunch. The cheeseburgers were very good. After lunch we went shopping at Washington Street Mall. Washington Street Mall is a pedestrian shopping district. During our visit to Cape May, the three block pedestrian-only shopping mall was in the midst of a complete re-do including new water and sewer infrastructure, new pavers and a completely new landscape. We saw the Easter bunny, while at Washington Street Mall. Bob took this picture of me with the Easter bunny. Located within the Mall area are several Victorian-style homes. This house reminds me of an elaborately decorated three-tiered “wedding cake”. This was not my first visit to Cape May. I visited Cape May one time before, in April 1983. During that visit, I stayed at Poor Richard’s Inn. Poor Richard’s Inn looked the same as it did in 1983. We left Washington Street Mall and drove to Cape May Point State Park, which is 2 miles from the city of Cape May. Located at Cape May Point State Park is the Cape May Lighthouse. We took pictures of the lighthouse and took a stroll on a nature trail. We walked the “Red Trail”, which was .5 miles long. This trail provided access to both the lighthouse pond east and west. Each pond has a blind or platform at the water’s edge from which you can view wading birds, ducks and swans. We saw this beautiful swan, while walking on the nature trail. We returned to our hotel, after our visit to Cape May Point State Park. It was a nice evening, and we went for a walk along the beach. The date was March 20, 2008. On that day we arrived in Atlantic City, NJ, after an approximate 7-1/2 hour drive from our hometown of Warren, PA. Please join me, as I provide a look back at our 3-day New Jersey vacation. Our vacation is broken into three parts: one blog post for each day. We left home at 12:20 pm and arrived at our hotel (Comfort Inn Boardwalk on S. Kentucky Avenue) at approximately 7:45 pm. I conducted an internet search today and discovered that the Comfort Inn Boardwalk closed in the Summer of 2008. It was purchased by Pinnacle Entertainment in order to make way for the building of their new massive hotel where the Sands was located. Our drive to Atlantic City was uneventful, although we did consider driving through downtown Philadelphia a hair-raising experience. Our GPS didn’t let us down, though. It directed us through the city and over the Walt Whitman Bridge with ease. Actually, our GPS provided excellent directions throughout our entire drive to Atlantic City. I wish my camera had been available, as we crossed over the Walt Whitman Bridge. A full moon hung above the bridge. The moon was so large that I felt I could almost touch it. Bob missed seeing this remarkable view because his full attention was on the road and the cars all around him. There was one other time during which it would have been nice had my camera been available. When we arrived in the heart of Atlantic City we were surrounded by a spectacular nighttime scene reminiscent of Times Square in New York City. I wish my camera had been available to capture that scene. We considered walking from our hotel to that part of the city to take a picture of the night lights and to check out the casinos; however, we opted to stay in our room after checking in. We were tired after our long drive to reach our destination. Since Tuesday, I have been sharing with you photographs and details of our vacation in NE Pennsylvania. In addition to seeing three waterfalls in the Delaware Water Gap Recreation Area on Day 2 of our vacation, our NE Pennsylvania vacation took us into New Jersey. We drove to Clinton, NJ where we toured a historic mill, visited a state park and ate dinner with friends. I had visited Clinton one time before. My first visit to Clinton was on March 17, 1987. I was living in Tinton Falls, NJ at the time. I stopped in Clinton en route Phillipsburg, NJ to visit a friend, who had recently given birth to a son. During that brief stop, I took one photograph — Clinton’s Red Mill. 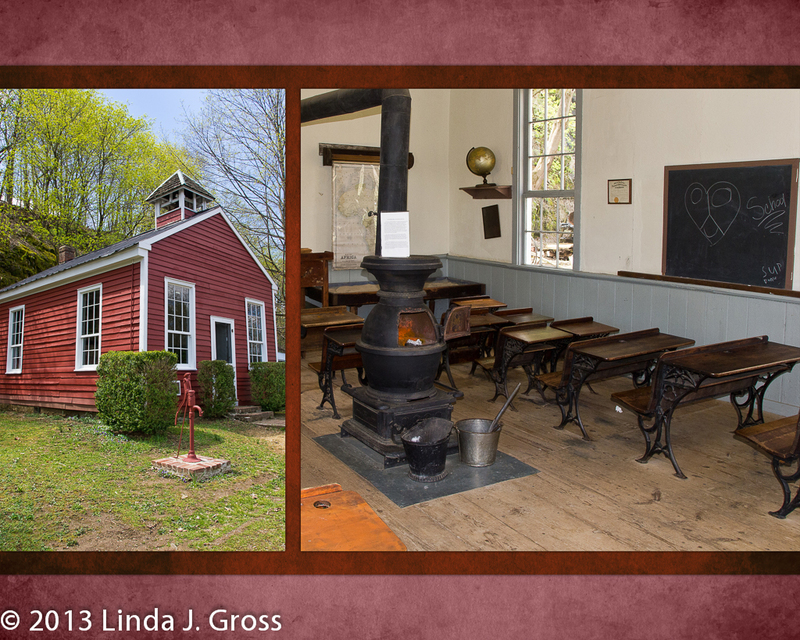 Twenty-six years later, I took another photograph of The Red Mill … and a lot more! 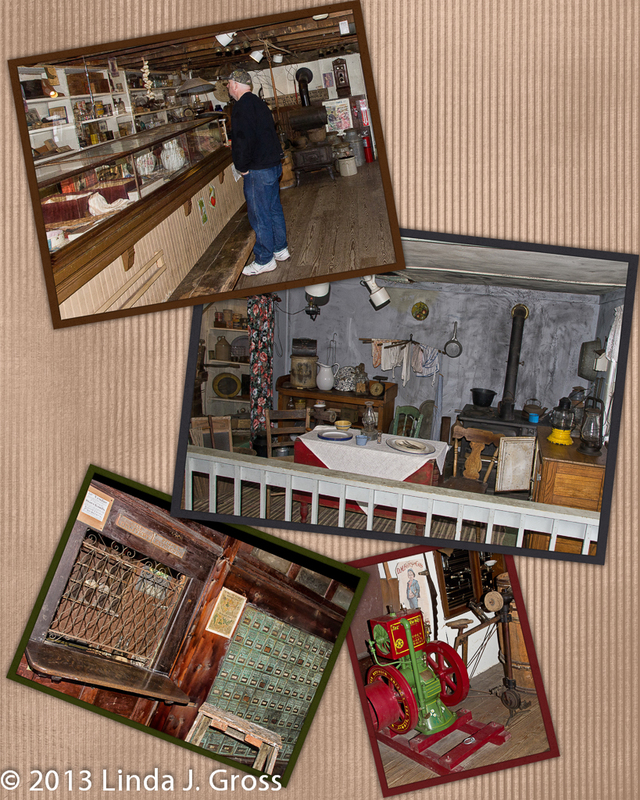 During our visit to Clinton this past Saturday, we went on a self-guided tour of The Red Mill Museum Village. Before touring The Red Mill we explored the buildings of the Mulligan Limestone Quarry and other buildings moved to the grounds. Dynamite was used to dislodge the limestone in the cliffs. Limestone rocks were sorted, by size, in the Screen House. The limestone that was crushed was used to bed railroads and paved roads. The Lime Kilns were used to burn limestone to make fertilizer. This was a two-family house, built for quarry employees. Each family had a kitchen and parlor, with two upstairs bedrooms. 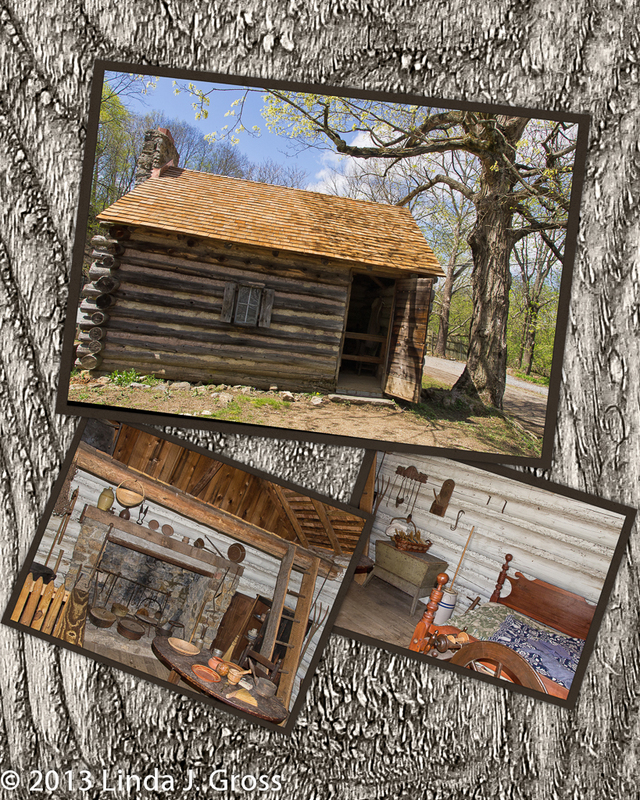 Today the tenant house displays a general store, post office and a c. 1900 kitchen. We toured all four floors of The Red Mill. There is a nice view looking across the dam from one of the windows. The Red Mill houses a large collection of artifacts. Each floor tells a small part of the history of the building. 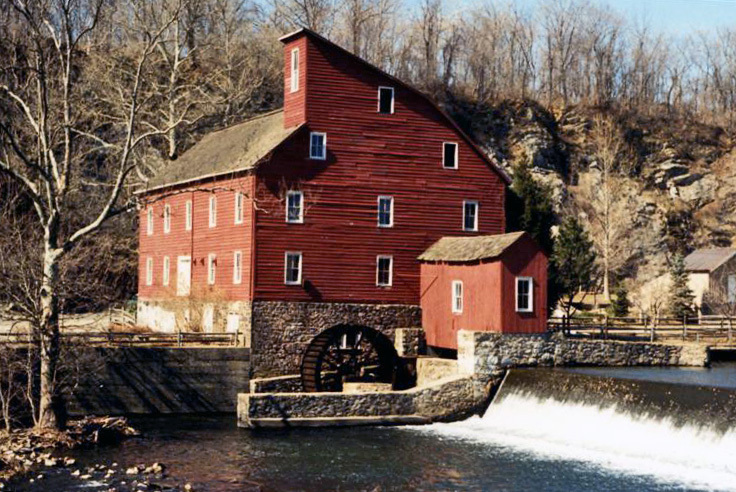 The Red Mill was originally built as a woolen mill. It was later used to process grains, produce peach baskets, talc and graphite. The Red Mill generated electricity and pumped water for the town. to the Main Street shopping area. We did some window shopping, listened to a musical quartet playing in an alley way (very good! ), and ate lunch at the Towne Restaurant. We had a few hours to kill before meeting our friends for dinner at the Clinton Station Diner, so we drove around looking for a park to visit. We found the Round Valley Recreation Area. The reason that we spent the past weekend in Stroudsburg, PA was so Bob could meet up and ride with a fellow Vulcan Riders and Owners Club (VROC) member from New Zealand, who was visiting this part of the USA. The NE Pennsylvania VROC group put together the ride and dinner. Dinner was at 6:00 PM at the Clinton Station Diner. Nine of us enjoyed dinner and conversation. We made new friends. It was a great night! The ride took place on Sunday. The meet-up place was Triplets Family Restaurant in Stroudsburg, where those riding ate breakfast. I stayed behind. I would not have enjoyed the ride, as it was a very cold ride. In fact the guys cut the ride short because it was so cold. It was well worth making the trip to NE Pennsylvania. We enjoyed seeing the waterfalls and the sights of Clinton, NJ. It was great to meet up with some of the riders from the NE Pennsylvania VROC group, as well as meet the rider from New Zealand. What a great weekend we had! Thus concludes my blog posts about our NE Pennsylvania weekend vacation. This concludes my blogs posts about our weekend vacation in NE Pennsylvania.